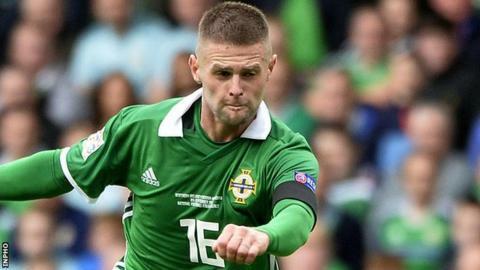 Sheffield United midfielder Oliver Norwood will remain an absentee for Northern Ireland's Euro 2020 qualifiers in June because of personal reasons. Norwood, 27, missed the Group C leaders' home wins over Estonia and Belarus on Thursday and Sunday. "I don't expect Oliver to be available for the games in June," said Northern Ireland boss Michael O'Neill after Sunday's dramatic 2-1 win over Belarus. Northern Ireland will face Estonia away on 8 June and Belarus three days later. When announcing the squad for this month's qualifiers, O'Neill expressed optimism that Norwood would be "back with us if not in June, certainly by September". Norwood joined the Blades on a permanent deal in January having spent the first half of the season on loan at the Bramall Lane club. The Northern Ireland player has made 34 Championship appearances this season, scoring three goals in the process. Following Sunday's last-gasp win, Northern Ireland lead Group C on six points - three ahead of Germany who earned a dramatic opening 3-2 away win over the Netherlands on Sunday night, with the Dutch also on three points after two games. O'Neill's side will begin a run of four concluding games against the Group C big guns with a home match against Germany on 9 September.